Just wanted to share with you the latest & greatest from LORAC! 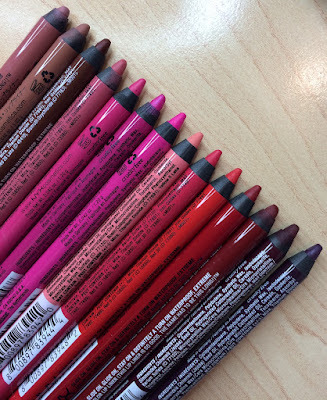 This post is basically just to show you some swatches and information- no so much a review (haven't even worn these yet!) I got this set for $35 from Ulta's website... I couldn't resist 12 high quality eyeshadows for that price! 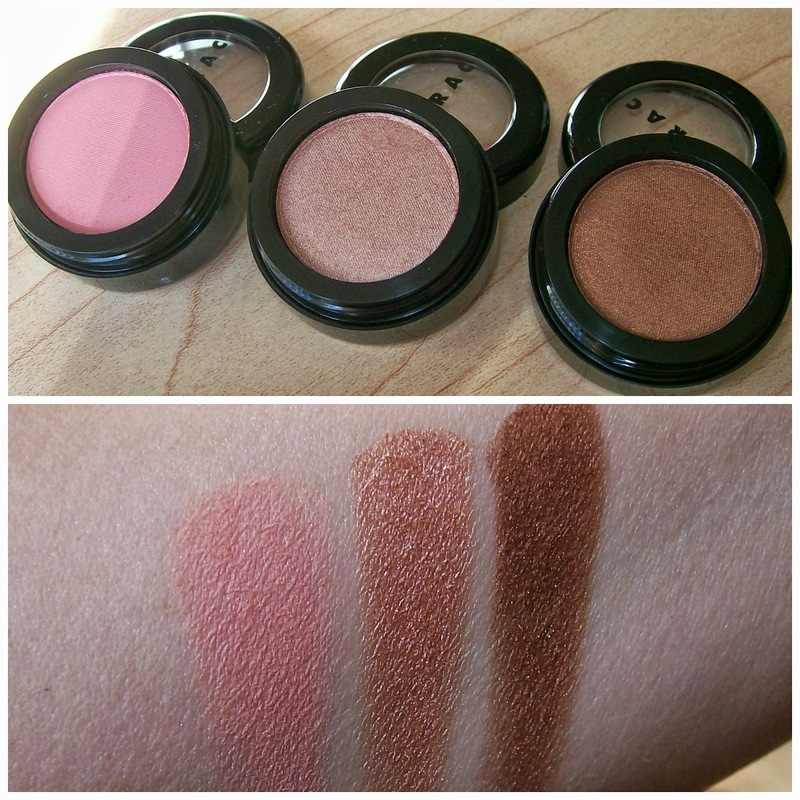 These are just slightly larger than the size of a MAC eyeshadow. This set is exclusive to Ulta, and while the shadow set is limited edition, according to LORAC, these are the brand's best-selling sparkle, shimmer, and matte shades. I checked LORAC's website just to see if these shadows were indeed available as singles... and I only found a few shades that were (the shades Bronze, Serenity, and Celebutante- maybe the others sold out?) However there are still other singles outside of this collection being sold for $6 each! It's some sort of VIP sale... they originally cost $19 each. Anyway- back to this set! It's interesting to see shadows being sold as a big set of singles. It wouldn't seem strange to see 12 shadows in a palette, but 12 individual full-size shadows is quite a deal. These shadows have twist-off lids, just so you know. As you can see, there are a variety of light, mid-tone, and deep shades, as well as a variety of finishes. Matte shades are in the minority- I only noticed 2 that are completely matte (Smokin' and Sapphire). Three shades are sparkly with some fine glitter (Luxury, Dazzle and Starlight), and the rest range from a satin to pearly finish. These are mostly neutrals with a few pops of color. The packaging says these shades can be used wet or dry, and shows a few examples of the different looks you can achieve. LORAC claims to have a "silky-smooth, highly-pigmented, and long-lasting eyeshadow formula"... and judging by my past experiences with LORAC shadows, I'd say that's a very accurate description! I'm a big fan of my Pro and Unzipped palettes, and these singles seem to be right along the same lines quality-wise as those palettes, judging by the way they felt as I swatched them. So here's a closer look at the shades, and I also made some notes on certain shades that were similar to those in my LORAC palettes. Again- this is not a full review... I just wanted to get some swatches out there in case you were interested in this set- we all know how fast limited edition collections like this can go. Just judging by those swatches though, I was truly impressed pretty much all of the shades. I was thinking those sparkly colors would feel dry or gritty, but they were really just as velvety soft as the others. Now here's a question for you- do you prefer having your shadows in palettes or as singles? Is this the type of thing you'd de-pot and put into a Z-palette? omg!! I have been dying for these shadows!! btw just subscribed to your new channel-there was no way I'd miss that! I do believe I may be the first to subscribe to your new channel! lucky me! yay! Would you recommend this or the Lorac Pro palette? Especially for neutrals...I'm leaning towards the Pro but now this made me confused! depends on how much you like matte shadows i guess...the pro has 8 matte and 8 shimmer while it seems this collection only has 2. just something to think about! Love the eyeshadows but more importantly just watched your video introducing "Beauty Broadcast Express" and hopped over to your new channel to subscribe - more fun videos to watch giving good in depth reviews. The colors are beautiful! I'm just not sure how often I would use some of the colors or if I would use them at all. But for the price it would be worth it to get the whole set and gift out the colors that I wouldn't wear or already have similar of. Plus Christmas is only 3 months away. I'm excited for your new channel. As for the LORAC, I love their entire line....absolutely everything. I do like to depot their shadows. If I had an empty z palette sitting around I would totally scoop up the dazzling dozen. I have a number of LORAC single shadows, but almost never reach for them. If I do end up buying this collection, I will definitely be depotting them! That said, I adore my Pro palette. Looks like a great start up package. Can't wait to see tutorials with these shades. 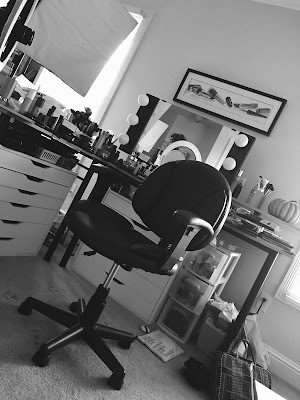 By the way Emily, love your "Get ready with me" videos! Seeing singles sold together seems like a hassle though! I'd have to unscrew and re-screw multiple lids at once, versus flipping and opening up a palette once! 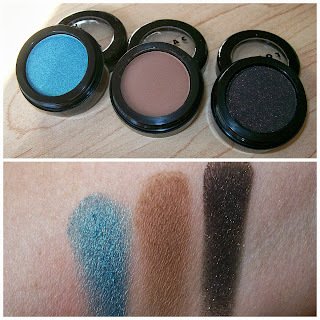 The shimmery shades in this set are gorgeous though, and that 'Sapphire' shade is divine. Emily Noel all day, errday? Sounds like a daily party! These look absolutely stunning! I'll have to see if I can budget this in before it sells out. : ) Thanks for the post! I got this set last week and tried the bronze and blue looks. Gorgeous shadows!! I subscribed to your new channel !!! I'm so excited to watch more of your make-up reviews ! I like palettes for the value but I like choosing single eyeshadows. I am interested in a few palettes for certain colors I would love to have, but I hesitate in buying any because of the colors that I am sure I will not use much at all. Saying that, that's funny to me because I think I would use almost every color in this set and it's a good deal! Hm, I'm stuck on whether I should pick this up or not. On one hand, I don't have many Lorac products at all, and the shadows look fabulous. On the other hand, I rarely ever reach for my singles. Though I suppose I can make a conscientious effort to use them more often. Congrats on the new channel :-) And oooooh these swatches are looking nice! I'm pretty sure Lorac is going to reformulate their single shadows (or maybe do away with them altogether). Right now they're trying to sell the stock they have left of these. Definitely prefer to be able to depot shadows and put them into a zpalette. That way I can customize each palette to whatever I want and be able to change things out if needed. I find I use my customized palettes much more than the ones I purchase. OMG I must go out right away and buy this eyeshadow set. 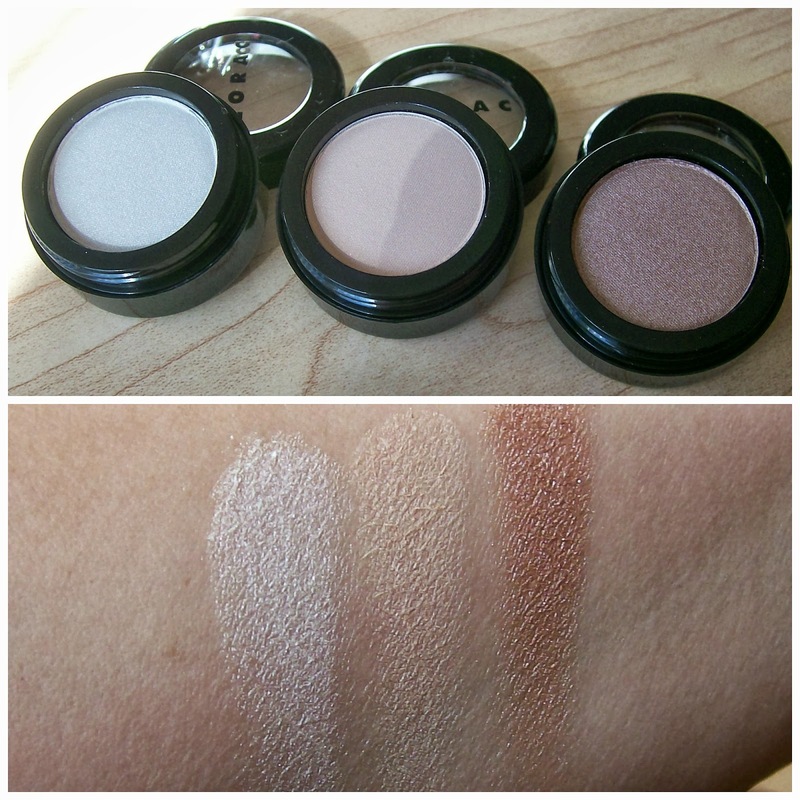 This is such a great deal for some amazingly pigmented eyeshadows. 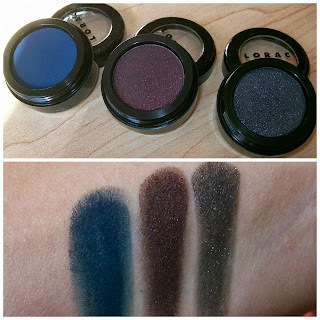 These Lorac shadows are a fantastic buy. The quality is just superb. While I like that you get full size shadows with these, I don't love the packaging. It's bulky and difficult to store. I think I would have preferred them in a palette, but I can't complain about the product itself. I've already created so many looks with this set. I'm glad you said that Smokin' is a total match for Taupe from the Pro Palette because I think it's a gorgeous color for my crease and I recently ordered my Lorac Pro palette so I can't wait to use it! These look amazing, though. And such a good deal! good in various classifications Users can see their desired films Mobdro for iPad be taken to the Kodi residence screen. Once again choose nice.